Originally published in TheEdge Malaysia, 1st – 7th January 2018 edition. Singapore has punched above its weight in its international relations. But it cannot always be the mouse that roared. Its principled stand on importance of adhering to international law and the UN Convention on the Law of the Sea, after the tribunal ruling against China in July 2016 on its South China Sea claims, earned the island republic opprobrium as the “little red dot” in Chinese media, and the detention by Hong Kong authorities in November that year of nine armoured vehicle carriers on their way back to Singapore after a routine training exercise in Taiwan. So it cannot be expected that, as ASEAN chair in 2018, Singapore would lead any great ASEAN resolution on respect for international law in the South China Sea. China’s fait accompli in what has become a Chinese lake would be quietly accepted de facto. Nevertheless, what can be expected under Singapore’s lead is an attention to detail in respect of the code of conduct in the South China Sea, which Beijing has accepted even if not whether it would be legally binding. There will, therefore, be this element of dealing with South China Sea issues, albeit softly-softly, on honouring principles of international law. Singapore’s reputation as the most competent of Asean countries is a double-edged sword. It is accepted but not always liked. Old Singapore Asean hands say quietly Asean is a Singapore idea, Indonesia and Malaysia particularly, coming in only later, although they were made to feel they were in from the start. Those countries, on the other hand, often feel Singapore does not really believe in Asean, only using it to serve its interests. Well, who doesn’t, but it cannot be said out loud. It is essential to understand this background when any member state takes over the Asean chair, Singapore in particularly. Member states really should stop taking the high Asean ground by saying that ZOPFAN (Zone of Peace Freedom and Neutrality) or the EAS (East Asia Summit) was their idea, and AFTA (Asean Free Trade Area) or the Asean Charter. They should be working together to fully achieve many of these half-realised initiatives. A leading Asean voice in Singapore has suggested the island republic should take the lead on reform of the Secretariat’s budgetary contribution to base it on the UN’s ability-to-pay formula, to make it more efficient than one based on equal contribution, as presently, which results in a puny budget and low staff capability. Indeed, the suggestion extends to offering Singapore’s retired civil servants to help achieve that more efficient Secretariat, which would lead to a more effective Asean. Business people would love it. But would Singapore put forward the suggestion and would the other Asean leaders accept it? The island republic’s diplomacy will have to be so delicate that the others do not feel Singapore is trying to show it is so clever. This is one of the problems with Asean. It would accept expertise from Australia, Canada, Japan or the EU, but not from its midst staring it in the face. A more efficient Secretariat would report on, and monitor, for instance, the further tariff removals Vietnam needs to make in 2018 for motor vehicles and spare parts, vegetable oil, refrigerators, air conditioners and dairy products – in fact 669 tariff lines – and whether or not non-tariff barriers have been established in their stead. That more efficient Secretariat, for example, could even make the simple proposal that there be among all member states an Asean rate of airport tax, lower than the international rate – and offer a cost-benefit analysis of such a step. At present, only Malaysia appears to have an Asean rate. So far, Singapore, through its foreign minister Vivian Balakrishnan, has said it would follow up on the code of conduct. This makes sense. With China’s acquiescence, it is a useful way to push ahead on the South China Sea without Asean – or Singapore for that matter – appearing to be totally going away with its tails between its legs. Singapore might as well also lead Asean into engaging China more deeply on environmental protection and sustainable development in the South China Sea, agreed at the China-Asean summit in Manila in November. More broadly, Singapore has stated the concentration in its year as chair of Asean would be on innovation and technology – in other words the digital economy or the fourth industrial revolution (4IR). This is timely. And Singapore is well positioned to take the lead. There are many opportunities and challenges of 4IR. The best way Singapore could contribute to Asean is by using the broad brush of technology to bring benefits in selected areas. Here, the facilitative use of technology at the Secretariat – therefore needing a bigger budget – could be the means to argue for contributions based on ability-to-pay formula for ASEAN’s greater good, without Singapore appearing to be the know-all. The fact of the matter is Singapore is well ahead in 4IR. It has to offer its knowledge and experience, especially in education and training for the digital economy, even as it would want to push for its benefits in such areas as e-commerce, e-payments and logistics. Most Asean countries are not only well behind in e-capable human capital but also will experience the displacement of employment particularly in manufacturing and basic service industries. The digital divide threatens seriously to widen the existing economic divide among Asean countries. This is the gravest challenge to ASEAN’s continued cohesion, which must be addressed if Singapore’s concentration on the digital economy is not to be seen as self-serving. As Asean chair in 2017, the Philippines emphasised the need for shared prosperity and championed the cause of the micro, small, and medium enterprises (MSMEs). The Asean Mentorship for Entrepreneurs Network (AMEN), which was conceived by the Asean Business Advisory Council, was launched to help MSMEs and to bring them on to the supply chains of the big companies. Greater use of technology – with better access to finance and management methods – would help them. MSMEs, which employ most of ASEAN’s working population, are the backbone of the regional bloc’s economy. If the backbone breaks with high unemployment and social turmoil, Asean breaks up. This has to be fully understood. Singapore has stated that the Philippines MSMEs initiatives, including AMEN, will continue to be pursued during its time as ASEAN chair. It has to follow this through with 4IR initiatives to help the small companies as well. 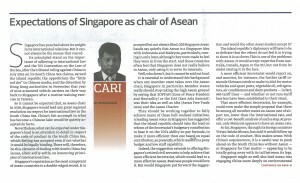 Thus, even with concentration just on economic and functional matters, there is plenty for Asean to do. With its great competence and expertise, Singapore should lead the region to apply its resources to be better integrated and performing – at least economically. While some more political matters, such as the code of conduct in the South China Sea, might need attention, it would be best for Asean to spend more time on what it can do best, which is regional functional integration. After so many years of effort to provide this great platform as well for the geopolitics of the region – with some success even if only as a talking shop – it would not be easy to avoid commentary on big issues, be it on North Korea, the Middle East or even those protected within the borders of Asean member states, like the Rohingya issue. Be that as it may, Asean must however spend more time on core issues on which it can forge common interests and benefit. If it succeeds it can then become that greater entity whose voice may carry more weight. 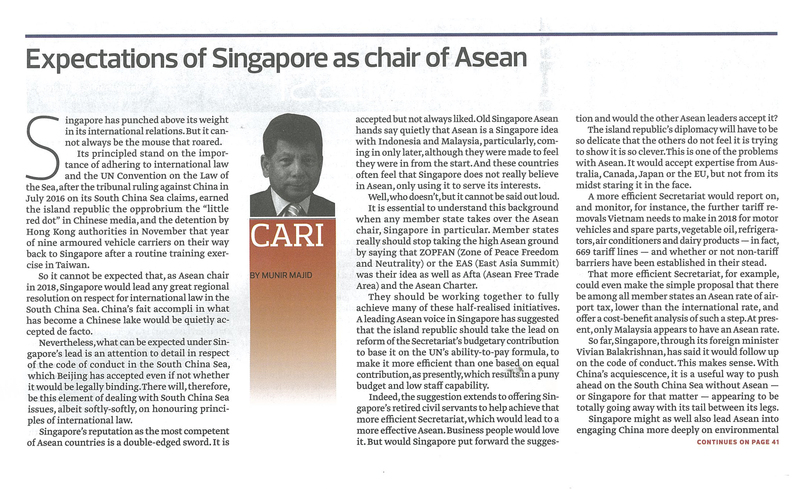 If the period of Singapore’s chairmanship of Asean results in yet another same old same old way of discussing issues, leaders moving around like headless chickens to pronounce on matters over which Asean has limited actual influence, progress towards that future will just not be made.